This is a beautiful waterfall with two distinct characteristics: a long, shallow slide at the top, and a short, steep plunge into a deep pool at the bottom. You can't see the top part from the base at all, and vice versa. But that doesn't matter - it's a beautiful falls and there is plenty of area to hang out and enjoy the view at the base. A limited view of the top portion can be seen from along the North Harper Creek trail, but be careful - especially if the rock is wet. You'll need to be extremely careful if the rock isn't completely dry; I recommend just going to the base. From the Wilson Creek Visitor Center at 7805 Brown Mountain Beach Rd., go 3.1 miles North to NC route 90 (one of the last unpaved state roads) and turn left. Go 1.8 miles and turn left on F.R. 464 (Pineola Rd). The trailhead is 4.9 miles up this road on the left and is well signed. You will pass a couple of other trailheads along the way. Take the North Harper Creek Falls trail (#239) downhill behind the sign, which follows an old logging road. It's mostly easy, but one spot has an old stick-built bridge which looks kind of sketchy - take care there. The trail leaves the road and becomes more of a footpath, climbing a little bit and then descending again. You'll reach an intersection (I'll call this "A") with the North Harper Creek Trail (#266), which goes straight and left. To get to the bottom of the waterfall (the best view), go left. This is a steep downhill for a short distance to the creek; then the main trail turns left here. An unmarked but obvious side path goes right; take that one. It crosses the creek after a very short distance - you should be able to rock-hop this but it might be a wade if the water is up (and impossible if the water is very high). 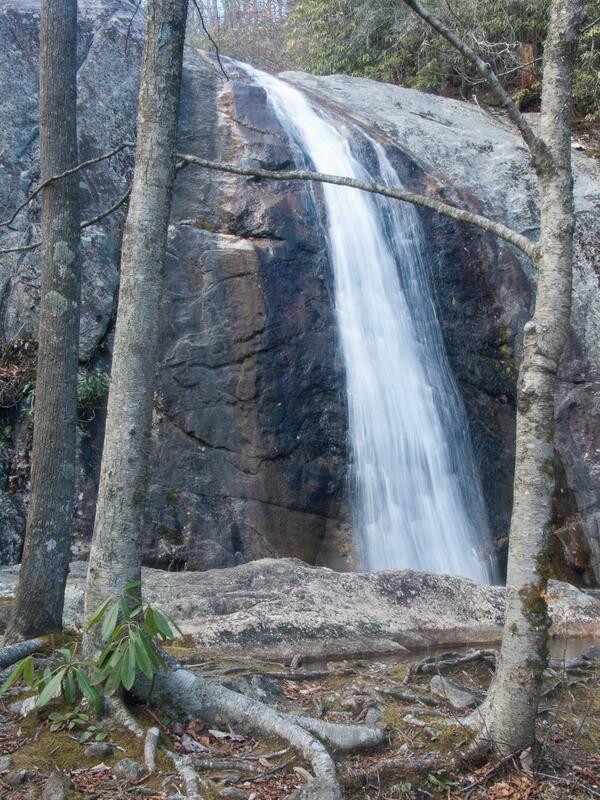 After crossing, go right (upstream) to the base of the falls in about 400 feet. You may find some little paths, or just walk through the woods, which are fairly open. You can reach the exposed rock area near the top of the falls by going straight back at intersection "A" above instead of left. The view is not that great in my opinion; also, you'll need to be extremely careful if the rock isn't completely dry, so I recommend just going to the base.